If you're like a lot of folks, today's still-shaky economy is pushing you to live more frugally—including keeping your car on the road as long as possible. And with gas prices bouncing around $4 a gallon in many areas, the last thing you need is to get hit with pricy repairs, traffic tickets, or other unexpected auto-related expenses. Help is as close as your smartphone. Dozens of mobile apps are available that can help you stay on top of basic auto maintenance, find the most reputable repair shops, avoid traffic backups, track your fuel efficiency, and generally keep your car on the blacktop and your bank account in the black. Here are a few examples. RepairPal (for Android and iOS, free): RepairPal provides estimates for common repair jobs and helps you find the best shops in your town to do the work. For example, when the Check Engine light lit up in my 2000 Honda Odyssey, RepairPal advised me that the light indicates a fault in the emissions system and that it would likely cost between $97 and $123 to diagnose. The app recently added a feature called "Top Shop" that lists local repair shops that are highly rated by consumers and that promise to match RepairPal's price quote; some also offer warranties for their work. RepairPal also offers roadside assistance for breakdowns, maintenance advice and checklists, and repair history logs for multiple vehicles. Car Minder Plus (iOS, $3): Doctors and car mechanics agree: a little preventative maintenance can go a long way. This app stores a maintenance and repair log listing details like oil changes, tire rotations, and tune-ups to help you keep track of what needs to be done when. You can also monitor your fuel efficiency for fluctuations, which could help identify potential problems early. All data is backed up to your computer, and you can email customized reports as needed. Carbonga (Android and iOS, $5): Carbonga is one of an assortment of mobile apps that take automotive diagnostics to the next level. Install the app, connect your phone to your car's on-board diagnostic port using a special OBD-to-iPhone cable (sold separately, $99), and get a report on your car's safety systems. The app interprets your car's diagnostic codes and gives you the scoop on the status of its air bags, antilock brakes, transmission, and more. It'll also tell you why your "Check Engine" light is on. You might not be able to fix the problems yourself, but at least you'll get a frame of reference for how much the repairs will set you back. 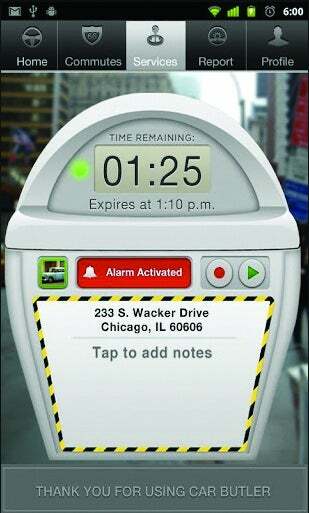 Car Butler can tell you when your parking meter is about to expire. Car Butler (Android and iOS, free): Car Butler is a comprehensive app that does everything but check your oil. Check weather and traffic conditions, compare different route options, and get driving time estimates before you head out. While you're on the road, you can also find nearby gas stations, parking lots, car washes, and other car-related businesses, and share information about your favorites with other members. It'll even alert you when your parking meter is about to time out. VehiCal (iOS, free): Particularly useful for business travelers who spend a lot of time behind the wheel, this car expense management app calculates and keeps track of all vehicle-related information and expenses, such as fuel consumption, tolls, parking, mileage, and more. You can create custom categories and save data in CSV or HTML format to send to the bean-counters at the office. iWrecked (Android and iOS, free): Here's hoping you'll never actually need this app—but if you do, it might help make a frightening situation just a little less stressful. If you're involved in an accident, use it to log all the details, including insurance information. Take unlimited photos of the damage and the scene and send a detailed PDF report directly to your insurance company. The app also includes emergency contact numbers and resources for taxis and towing. Trapster (Android and iOS, free): Have a lead foot? Trapster could save you from your next speeding ticket. Sign up, and this app will alert you to speed traps, hidden speed cameras, accidents, and other potential road hazards. It'll also let you know when the speed limit changes and you're going too fast. Annoying? Maybe, but you'll be safer—and richer—for it. GasBuddy (Android and iOS, free): This app helps you find the gas station with the lowest prices in town.